PAUL JAY, SENIOR EDITOR, TRNN: Welcome to The Real News Network. I’m Paul Jay in Washington. 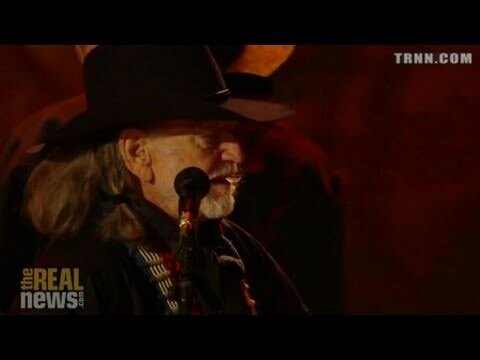 And that was Willie Nelson at a Farm Aid concert. And you may wonder, well, why the heck do farmers need aid, given how high food prices are getting? In fact, the USDA says $99 billion will be divided up amongst American farmers. But a new study by Tim Wise suggests it ain’t quite so simple. Small family farms are not doing so well. And to explain all of this to us is Tim Wise. Thanks for joining us. TIM WISE, DIRECTOR OF GDAE, TUFTS UNIVERSITY: My pleasure. JAY: Tim is the director of Research Policy Program at the Global Development and Environment Institute at Tufts University. Name of report is Still Waiting for the Farm Boom: Family Farmers Worse Off Despite High Prices. First of all, describe, tell us about the situation. If prices are so high, why are family farms–and here we’re talking about smaller family farms–why aren’t they doing well? WISE: Well, it’s a fairly well-known problem that farmers would tell you about if the USDA or the media got out to talk to them much. They indeed are seeing higher prices for their products, but they’re being squeezed between much higher expenses as the prices for all of their inputs go up–fertilizer, seeds, all the rest of it–and the farm payments have gone down, as some of those farm payments from the government were tied to price. So with prices higher, farm payments go down. Surprisingly enough, in this class of–I’d call them small to mid-sized family farmers–their household income is actually lower than it was in the earlier part of the 2000s, when farm prices were actually lower. JAY: Now, just to be clear on this, the bigger farms a lot of us think are corporate farms, but they’re actually wealthy family owned farms with a lot more acreage. So these mid- and small-sized farmers are, I guess you can say, to some extent’s competing with the bigger farms. Now, the bigger farms are doing relatively better. They are getting more of this net cash. Is this true? WISE: Well, the biggest farms–I mean, interesting–you know, the USDA will release its farm income projections and farm income numbers every year, and it often comes in these high price years with kind of glowing language about boom times in the heartland. What–I really did this study because, you know, Boom for Whom is really the–was the title of an earlier study that we did, and it was because, yeah, there are some farmers, the biggest farmers, who are farming lots of acres, can sink, can shift into the crops that have the highest prices, can lock in the futures contracts, can bid down the supplier costs, and can on small margins with high volumes make money. They are indeed family-owned farms. Some of them are huge. One of the shocking pieces of information in this study is that the largest farms in the United States are actually accounting for 88 percent of all of the farm income accounted for by the USDA. The smaller category of farms aren’t small farms, I mean, not what a lot of us would think of as small farms. Average acreage on this category of farms–sales between $100,000 and $250,000 a year, so they’re commercially viable, or they have been in the past–they’re 1,100 acres. You know, grain farmers are in the 500 to 700 acre category. Ranchers are bigger than that. We’re not talking about tiny farms. And yet, you know, they’re showing that expenses are basically gobbling up almost all of the increases in farm revenues and sales. JAY: So that’s what I was going to ask. If the small and medium farmers aren’t making money at a time when food prices are so high, who is? WISE: Well, the largest farms are doing better. WISE: And then, you know, the food chain, as we’ve seen, is increasingly dominated by–not farmers. It’s well documented that a smaller and smaller share of the retail food dollar ends up in farmers’ pockets. I forget the number now, but it’s very low and consistently declining. Where does it end up? Those who supply farms–Monsanto for seeds, and a bunch of others for seeds, not just Monsanto; John Deere supplying tractors–they, a lot of those, are large corporations. Some are in monopoly positions. A lot of them are the only supplier for what they’re selling. And their prices have gone up in part because the prices of all commodities have gone up, and in part because they have a lot of market power and they can command high prices. JAY: Yeah, because generally prices have not gone up in the last few years very much. I mean, making a John Deere tractor, in theory, has not gotten more expensive. WISE: Well, a lot of it’s petroleum-driven, a lot of it’s commodity-driven. All of the commodities move together because commodity markets move that way now with the financialized commodities markets. But on the other end, you get farmers getting their prices bid down for what they sell, and it’s bid down because they’re selling to Smithfield for pork, or they’re selling to Cargill to a grain elevator, or they’re selling–. And those prices have been bid down because they’re ultimately all selling to Wal-Mart, and Wal-Mart’s bidding down prices. So the farmers don’t sit at the bottom of this food chain; they sit right smack dab in the middle. It’s been described as an hourglass. And at the top, you have the Wal-Marts and the Smithfields and the users of these agricultural raw materials. At the bottom, you actually have the suppliers, who are making a lot of money selling farm equipment, seeds, etc., fertilizer, and the rest. And in the middle, you have farmers squeezed by–who can’t band together, haven’t been able to band together and fight back with establishing any market power themselves. JAY: So what kind of changes do they want to see? I mean, what’s affecting them right now? And longer-term what do they want to see? WISE: Well, one of the more promising changes that’s been at least proposed under the Obama administration is some serious antitrust legislation. The Obama administration under the US Department of Agriculture has issued a rule on undue market power for meat packers that would go a long way to leveling the playing field for independent livestock producers. JAY: So this is a company like Smithfield. WISE: It’s all in process now. The GIPSA rule is sitting there being fought over and fought back against by the–waiting to be implemented. And, you know, I think before you even get to the 2012 farm bill, which is an important–will be a very important spot for debating these reforms, the crisis right now is that the debate is over undoing some of these existing laws and regulations. JAY: What else do they want to see? WISE: Dodd-Frank, the Dodd-Frank financial reform legislation, has very important provisions for regulating commodity derivatives. That would squeeze some of the financial speculation out of agricultural commodity markets, dampen down some of the price volatility we’ve seen. And Wall Street’s come back pushing hard against the Commodity Futures Trading Commission. JAY: How does that affect the smaller farmers? WISE: They see–if we could squeeze out the financial speculation from distorting the futures markets, they’d see much more stable and functioning markets for their products, and it would allow them to actually predict their prices better, lock in their prices more reliably. And the speculation and the volatility actually raises the cost of even participating in those markets, because volatility’s something you have to insure against, and you pay higher for more insurance. WISE: I would say it’s equally important to address the credit issue. People, family farmers, have suffered a great deal because of the constriction of, contraction of credit. It’s much harder to get. And a recent report by Farm Aid and by the National Family Farm Coalition and a couple of other groups documented just how much harder it is for farmers to get credit. You can’t run a farm without credit. And they found that more and more farmers are actually running their farms on credit cards. And there is no–. JAY: [incompr.] this is credit cards at 19, 20 percent annual interest. WISE: Credit cards that, you know, if you can–if you get caught with those levels of debt on credit cards, you’re not only putting your farm at risk; you’re putting your entire household at risk. Bankruptcies are up in farm country. And so serious attention needs to be paid to the kind of credit provision and credit extension that can keep family farm sector functioning. JAY: And what’s the politics of this? You’d think there’d be more votes helping small farmers than lesser big farmers. WISE: I think that’s true. But I think there’s a lot of entrenched politics around farm issues in general. There’s a lot of lobbying money that flows. And it doesn’t–you know, people talk about the farm lobby as if it’s one thing. There’s small to mid-sized family farmers grouped in organizations like the National Family Farm Coalition. They don’t have the same interests as Cargill, who has its own lobbying effort, and the meat packers, who have their own lobbying effort. There’s no such thing as the farm lobby. There are a lot of farm lobbies. And there are a lot of different groupings within the farm community as well. They certainly have their constituencies. I think the politics right now is the deficit and deficit-cutting politics. And the austerity politics that are driving a lot of policy discussions in DC right now are definitely infecting some of these deliberations. JAY: One of the things that is on the table is the lowering of subsidies for farmers. How big an issue is that, and how important? WISE: It could be very important. I think a lot of the family farm groups would rather get their money from a stable market than from the government. And they’ve advocated policies to stabilize prices at a fair level, and through things like grain reserves and the like, and so that there wouldn’t need to be any subsidies. In the absence of policies like that, one of the surprising pieces of the data that I looked at was family farmers in this category that I looked at get 30 percent of their net cash farm income from government payments. It’s not a big amount of money. It’s $9,000. JAY: But it’s big if that’s a third of your income. WISE: But it’s big because you’re right on the margins. That’s the money that, because you know it’s there, the bank will give you a loan. If that money wasn’t there, would the bank give you a loan? Maybe not. WISE: Well, that’s right, that’s right. And that’s where the–the land doesn’t go out of production, the land goes–. JAY: Yeah, this process of monopolization just speeds up.